Are prepositions really so difficult? What if I told you that IN JUST 5 MINUTES I could help you solve some of your most confusing preposition problems? English learners everywhere are confused about prepositions, and English learners every always say it’s one of their biggest difficulties. 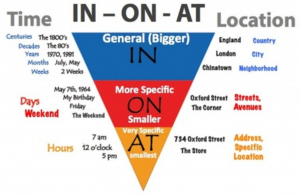 But with the right strategies, prepositions DO NOT need to be so complicated. If you take a few minutes to learn a few tricks, and visualize the problem in a new way, your experience learning prepositions will be a lot easier. This is gonna be fun! Ready? 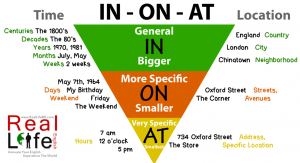 Today, we’re going to explore how the prepositions AT, ON, and IN are used with TIME and PLACE, and use a formula that works in around 90% of cases. It’s not perfect, but it gives you a great foundation to learn the exceptions. 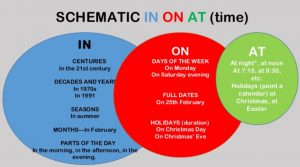 Given the fact that most people are visual learners, and most prepositions are best taught in a visual way, we’ll also use graphic organizers and a video lesson to teach this. Before we explain a bit more, let’s take a good look at the picture one more time below. Try to get a general idea of the organization and proportion. Description: Specific times or small time periods. Description: the address or specific location, specific points. The mind map pyramid below explains TIME in the same way we did above (only this one is not inverted), but it also introduces prepositions PLACE/PLACEMENT, which we will focus on here. Again, these rules are not an exact science, but they will help you get past 90% of the preposition confusion that most people encounter with IN, ON, and AT. After you learn these techniques, you will not only speak a lot better, and with a lot more confidence, but the final 5 to 10% of prepositions won’t seem too hard. It will probably take some study time and some memorization of collocations (“in the kitchen,” “at the mall,” but you will see that it’s a lot more manageable. The point is that you don’t want to be thinking about the rules too much when you’re communicating. This will help make most of the process unconscious and automatic, which is exactly what fluency is. You can use Anki, a really effective vocabulary study tool, or other free study resources that can make your process a lot easier to learn using these prepositions. Another thing that will naturally help is reading and making English a part of your life. These are all very important parts of the Real Life English methodology. Make sure you grab a copy of our popular e-book, 101 Words You Won’t Learn at School. since now, i’ll study and consult this! Dear Justin, thanks a lot for this. I am sure it will help many. I was reading your post, and the explanation on how to use "in" and "on". I have also heard that "in" is used for small means of transportation and "on" for larger ones. Do you agree? For example: one should say on a tractor, not in a tractor, right? Thanks in advance for your time. Yeah I think you're right, Paulo! I'm gonna have to use your input to improve the article. Thank you for commenting. I'd like to have it printed. It’s worth a try to make easyer the explanation about such a trick subject lile prepositions – at least for Brazilians. However, in my view, the pyramid would be useful only if we could take it printed in our pocket! Dear Justin, thanks a lot for this information. Your post very good , thank you very much. thank you so much…very useful to all learners…we love you! This video is helpful for me, thanks so much. I am ayoung lady.I have never used this site before…and I dont know how to use it.Im trying to do my language arts homework.I DONT KNOW HOW TO DO IT THO!! some one help me plzzz!! ???? ???? who r u?? really very enjoyable and benficial for all learners. Where are you from, Paul? I’m American and we say “on the weekend.” I did, however, mention the British use of “at the weekend” in the video. Thanks for watching and commenting. Mardiyya El-Hazeema Hi, Mardiyya. Your BROTHER, Paulo, has the following information for you: if you can stand and move/walk inside a vehicle you can use "on". If you cannot move/walk inside the vehicle you should use "in', instead. So, please use "in" a tractor, not "on". I hope you can move away from your doubts now. Best regards. Thank you for this. 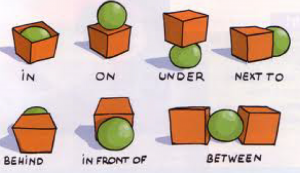 You have wonderful diagrams that will be really helpful explaining prepositions to my students. THANK YOU! Thank you for examples of prepositions and words encouragement for we. I am glad and to learned english with you. Justin, you're the best! Great video! excellent, all my doubts were taken, tank you. Preposition learn in easy way. Couldn't be more satisfied with lecture when it comes to preposition. thank you… I'm from near Seattle also. very very helpful. thank u sir.